According to the flow of charged particle in a circuit, there are two types of current. Direct current (D.C) is the type of current in which the polarity of an electrical source does not change with time. Batteries and dynamo are the sources of direct current. 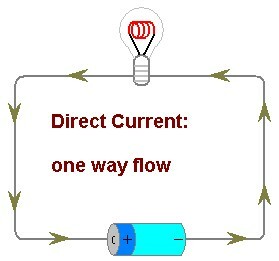 Direct current flows from the positive terminal of a cell to the negative terminal of the cell. 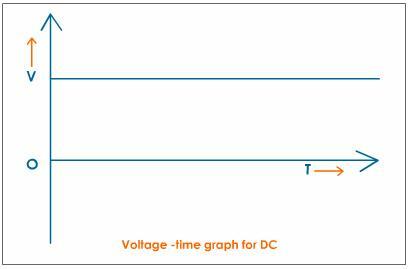 DC current can be changed to AC current by the use of an inverter. 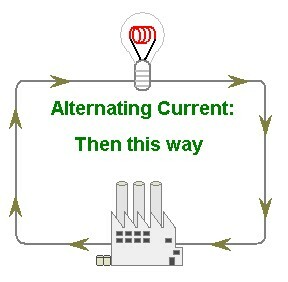 Alternating current (A.C) is the type of current in which the direction changes at a regular interval. The current used in power supplies is alternating current. It flows in one direction during the first half and in the opposite direction during the other half. The frequency of electricity supply I Nepal is 50 Hz, which means the polarity of the alternating current changes 50 times in one second. An A.C generator is the best example of a source of A.C. AC current can be changed to dc current by the use of a rectifier. In D.C current, the polarity of the current does not change with time. Alternating current changes its magnitude continuously and reverses its direction periodically. D.C voltage cannot be altered by transformers. A.C voltage can be altered by transformers. It is generated by battery and dynamo. It is generated by an a.c. generator. Fuse is the special wire that melts when a certain amount of electricity flows through it. It happens due to the heating effect (link to the heating effect) caused by electricity and we are going to talk about it later on. Fuses are made according to the maximum amount of current flowing into the circuit. If a circuit needs small amperage of current then we can use fuse with low amperage (in household normally 5 to 15A of fuse is used) and if the circuit needs high amount of current then high amperage of fuse is used (in small-scale industries up to 30A of fuse is used and in heavy industries fuse use varies greatly). Fuse is made from a special alloy of tin and lead and the amount of lead and tin determines the capacity of the fuse. The small wire is enclosed in a glass case and sealed with small iron plates. But if we are using a fuse box then, the setting is different. To know what capacity of a fuse to use we have to find out how much of current is needed in the circuit. For that, we have to know the potential difference (V) of the circuit and total power drawn (P) by the appliances in that circuit. Using the formula, I = PV. We know the total current flowing in the circuit. Now if we use a fuse that has less amperage than the current flowing in the circuit the fuse cannot handle the flow of charged particles and breaks. 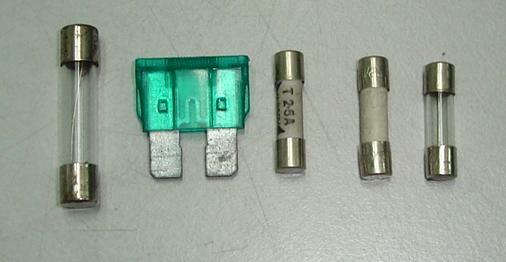 So, we have to use the slightly higher capacity of fuse than that of current in our circuit. In Nepal, the electricity distributed comes in two wires one live (also called phase) wire and another neutral. The live wire acts as the positive terminal and neutral wire act as the negative terminal. Both the wires are connected to a meter box in our home, also, the live wire has fuse associated with it. All the current flowing into our home flows through it. The normal capacity of that fuse is 15A but it can be increased or decreased according to the household needs. Then from another side of the meter box, both (live and neutral wires) are taken out. Those lines are taken into a switch box from where lines for different rooms are panned out. The switch box also has its own fuse for each line taken out from it that regulates current going into each room or distribution board. If the distribution board is used then the individual lines to rooms are distributed from here. In our home along with live and neutral wire, an earthing wire is also added. Earthing is a system where excess electricity is passed through it into the ground. Earthing can be done in various ways. Mostly in earthing a wire is attached to a plate or nail which is inserted into the ground from the main switch box. Now the electric circuit of our home consists of three wires; the live wire that carries current and acts as the positive terminal, the neutral wire that act as the negative terminal and earthing wire that carries any excess electricity from the circuit into the ground. A switch must be added to the live wire. So that when the switch is off there is no electricity running through the wire. Fuse if added must be added to the live wire. Because if electrical appliances draw more current than needed fuse will go off and there won't be excessive current in the circuit. The capacity of fuse must be chosen appropriately for the current requirement. The normal household does not require much of electricity so smaller fuse can be installed but for small-scale industries, larger fuse than the household is needed and for large industries where heavy machinery are to be operated, a large capacity fuse is required. Each room or flat must have different fuse associated with them. If one fuse goes off then only that room's (flat) electricity is cut off rather than the entire house. The places where wires are laid and switches are placed must be prevented from water or moistness. Since water can conduct electricity we can get shocks and loss of electricity can happen. The line to the power socket and the bulbs must be separate. If there is a short circuit in the power socket, then also, we can light bulbs. When we see a wire we actually see copper wire enclosed in a casing of different colors. Those casings are there to insulate the wire and we do not get a shock while touching it. The colors of the wire differ according to their type and country it is found. Normally in Nepal live wire has a red casing to it, neutral has black and earthing has a yellow color. But some might use brown colored wire for live wires, blue for neutral and green for earthing. The coloration is done because it is easier to know which wire is live or neutral or earthing. There are two types of current. They are AC current and DC current. In DC current the polarity of the current does not change. 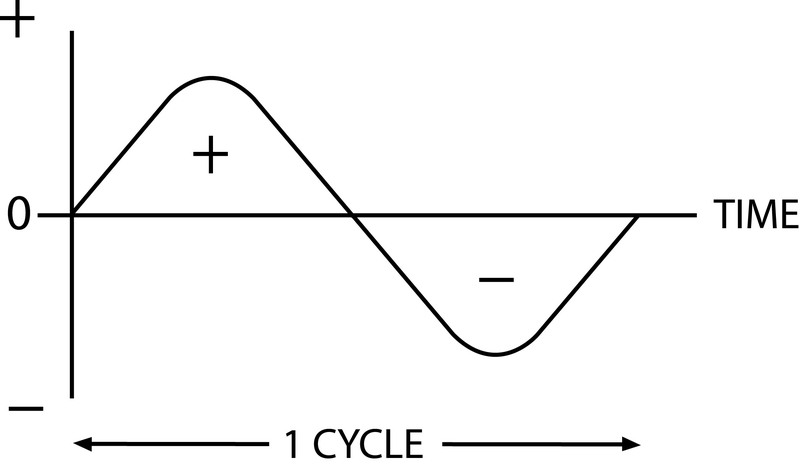 In AC current the polarity of the current changes according to its frequency. Fuse is the special wire that melts when the certain amount of electricity flows through it, Fuses are made according to the maximum amount of current flowing into the circuit. To know what capacity to fuse to use we have to find out how much of current is needed in the circuit. For that, we have to know the potential difference (V) of the circuit and total power drawn (P) by the appliances in that circuit. If the polarity of an electrical source does not change with time, it is called direct current. Battery and dynamo are the sources of direct current. Alternating current (A.C.) changes its direction at regular intervals. C generator is the source of alternating current. What type of connection are made in household wiring? Write one advantage of that type of connection. In household wiring, all of the electric bulbs with separate circuit are connected in parallel and each of the bulbs is controlled by a separate switch. The advantage of parallel circuit is that by using different switches, we can turn on and off the bulbs according to requirement. In a household wiring (domestic circuit), the electrical appliances are connected in parallel, why? Each appliance in a room can be independently switched on or off. The same potential difference is applied across each appliance. If more appliances are added in a room it makes no difference in the performance in the other appliances. 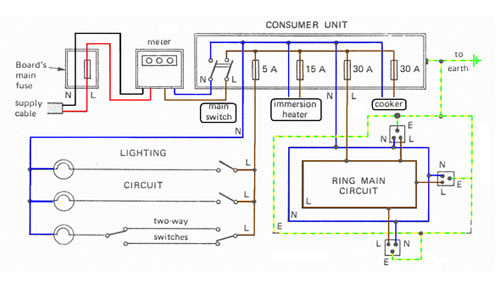 Why is domestic wiring not done in series circuit? If one line is overloaded or short circuited, the fuse in the whole circuit is blown off. The other distributed circuits are also affected. If the electric power is to be switched off in a room for repairing or for any other purposes, the electric power in whole circuit is blown off. What is meant by phase or live wire? The electric wire which supplies electric power to the electrical appliances is called phase or live wire. In household wiring, it is red in colour. A fuse is a safety device which is made up of tin and lead alloy and gets connected to the circuit in such a way that it controls the maximum limit of current passing through the circuit by melting itself. Write down two characteristics of fuse wire. A copper wire cannot be used as a fuse. Why? A copper wire cannot be used as a fuse because it has high melting point and low resistance. Due to this reason, it does not easily melt and the circuit is not broken. How is the capacity of a fuse determined? The capacity of the fuse is measured in terms of the unit Ampere. To find the capacity of the fuse, it is necessary to know potential difference and amount of current that flows. Then the multiplication of two gives the minimum value of fuse. For the fuse, it is required to use slightly high capacity fuse than the calculated value. The fuse must be connected in live or phase wire. Why? Fuse should always be connected with a live line. When the fuse goes off, current is cut off and there is no chance of electric shock. 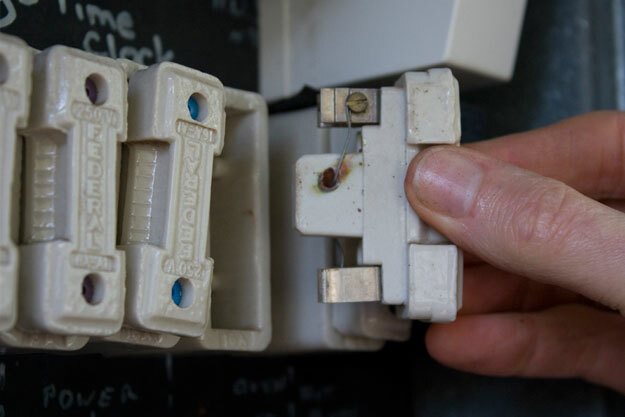 Fuse should be always connected to the live or phase wire so that if the fuse is broken due to the over current strength there won't be electrical accident as well as there won't flow the current to the equipment. When two wires are connected directly in an electric circuit, electric spark appears and the circuit is shorted which is called short circuit. The spark is due to the large flow of current. The arrangement of the electric circuit to make the flow of charges to the earth is called earthing. The earthing prevents the damage of the property, life and also prevents the electric leakage. It also saves the damage from the lighting. Many electrical appliances are earthed. Why? In electrical appliances and electronic devices by short circuit or any means, flow of current may take place. Due to over flow of current in the devices, they may damaged. To prevent such damages, one of the way is to make the charge or current flow to the earth. For such purpose, the appliance is connected to the earth and is called earthing. The insulators of wires used in the domestic circuit connection is coloured. Write the two advantages of making these covers colourful. It is easy to identify the wire in the electrical work inside the ground. 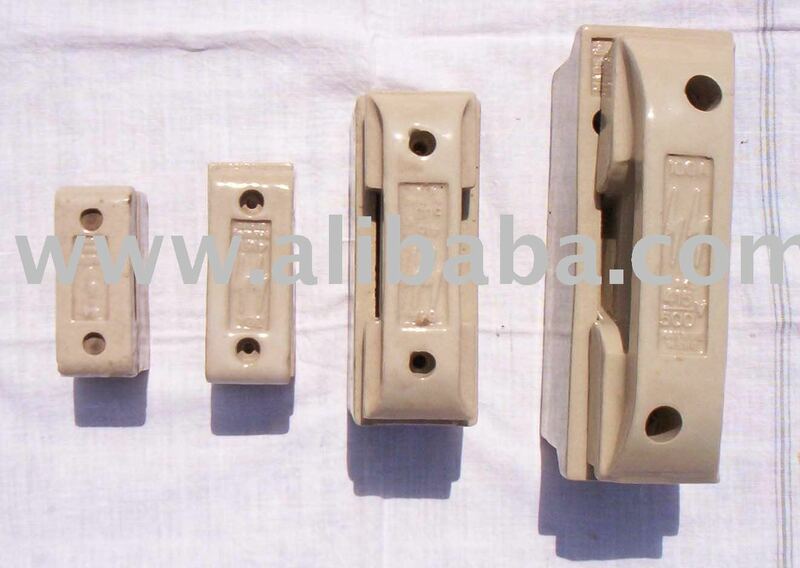 It is easy to identify the phase wire, neutral wire and earthing wire. The polarity of the current does not change in ______. The polarity of the current changes according to its frequency in ______. The polarity of electricity provided in Nepal changes _______. The special wire that melts when certain amount of electricity flows through it is ______. Which color is used for all purpose? 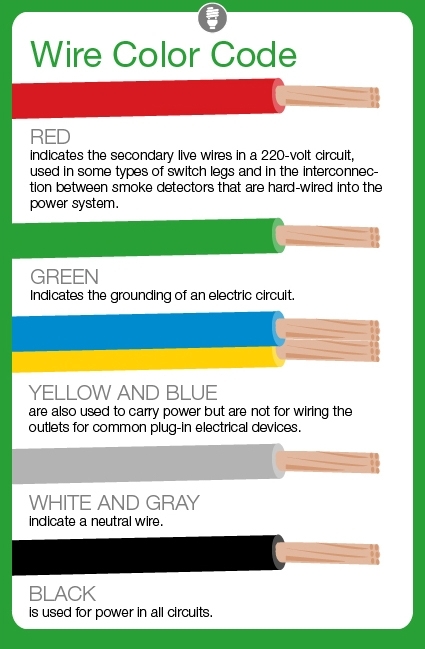 Which color is used for the grounding of an electric circuit? does fuse have low resistivity? why is load shedding happened ? Any Questions on 'Types of Current and Domestic Electrification '?